Surf Slide is a typical advertising-supported application that will flood your screen with various commercial advertisements. In addition, it might collect information about your browsing habits; thus, you should delete Surf Slide as soon as possible. Even though this adware is not as dangerous as Trojans or rootkits, you should still be very cautious, because Surf Slide can expose you to potential threats. This can happen very quickly, because you might be redirected to websites full of malicious software after clicking on any of those in-text, interstitial, search-related, or pop-up ads. The only effective way to stop these commercials from appearing is to delete the adware from your system. Thus, you should do that as soon as possible. 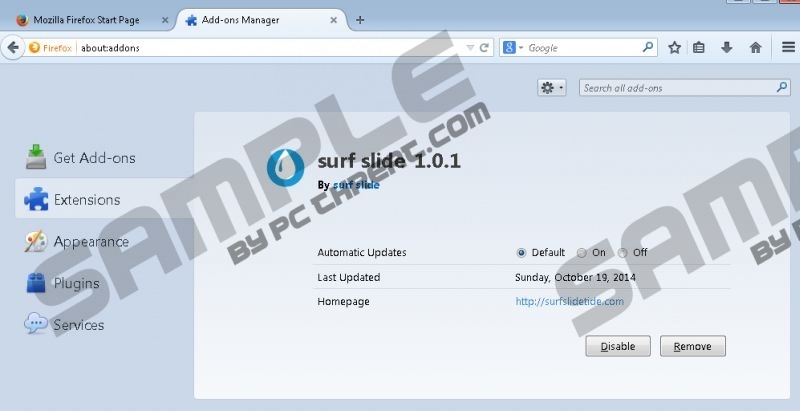 Surf Slide has replaced such programs as Cling-Clang, Surftatic, Albrechto, Gooternet, and Fortunitas; however, it does not mean that they cannot slither onto your computer as well. It has been found out that these SuperWeb LLC applications, including Surf Slide, not only show ads, but also collect non-personally identifiable details. Luckily, they are not interested in personal details; however, they will still record the names of the websites you visit, your search queries, and other information. Thus, you should make sure that it is impossible for adware programs to enter your system without your permission. The research carried out by our security experts has shown that the majority of computer users allow Surf Slide to enter the system after clicking on advertisements offering to update Java, Flash, or Flash Player. In most cases, computer users detect such ads on torrent and file-sharing websites; however, there is always a possibility that you will come across them on other websites as well. Do not click on them if you do not want to end up with a bunch of threats. Of course, malicious software might enter the system using other tactics as well; thus, you should definitely install an antimalware tool on your system and keep it enabled all the time. If you do so, you will definitely not allow infections to enter your system without your consent. The majority of advertising-supported applications can be removed via Control Panel. Surf Slide is no exception. Of course, you can get rid of it automatically as well; however, you will have to acquire an antimalware tool first. If you are interested in our opinion, we believe that SpyHunter is one of those tools that can be trusted 100%; thus, we definitely recommend using it in order to get rid of all the existing infections. Quick & tested solution for Surf Slide removal.